ME stands for Myalgic Encephalomyelitis. Benign Myalgic Encephalomyelitis (ME)/Post Viral Fatigue Syndrome (PVFS) is a multisystem, complex, acquired illness with symptoms related mainly to the dysfunction of the brain, gastro-intestinal, immune, endocrine and cardiac systems. ME/PVFS has been classified as a neurological disorder in the World Health Organisation's International Classification of Diseases since 1969 (ICD 10 G93.3). Since 1992, the term "Chronic Fatigue Syndrome" (CFS) has been included in the Alphabetical Index and indexed to G93.3. To date there is no known specific medical diagnostic test to determine or confirm a correct diagnosis nor is there any specific treatment for this condition. 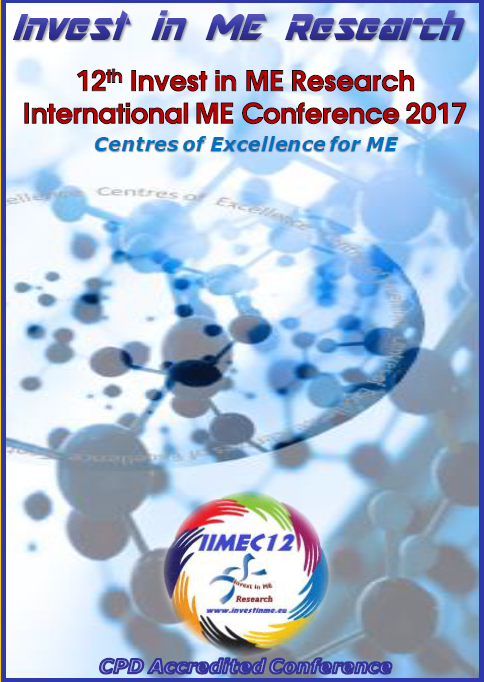 Our annual international Conferences and research Colloquiums are designed to bring together researchers, clinicians, patient groups and patients/carers in order to make progress in research into ME. These are CPD-Accredited events held in London. Our conference trailer is below. 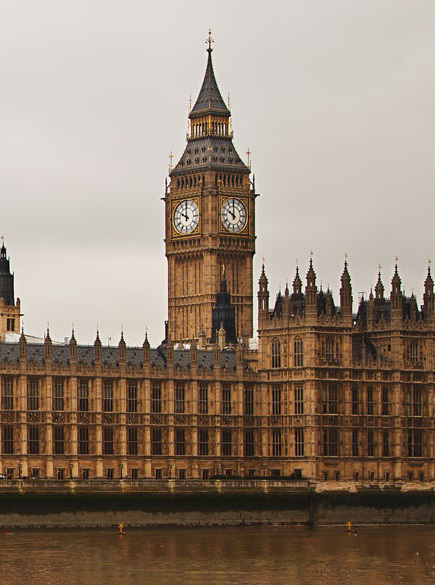 The APPG (all Party Parliamentary Group for ME) meetings are intended to allow MPs to discuss issues and topics related to ME and provide chance for the patient community to create awareness in order to influence policies toward ME. Although not always able to attend in person Invest in ME Research have always submitted comments for consideration at these meetings. Once the charity has also arranged a special APPG meeting in parliament prior to one of our international ME conferences. As one of the first actions on being invited to be part of the APPG the charity arranged with APPG Chair Annette Brooke a meeting in parliament between MPs from the APPG group and some of the researchers at the IiMEC6 conference. The Chief Medical Officer (CMO) is the most senior advisor on health matters in a government. 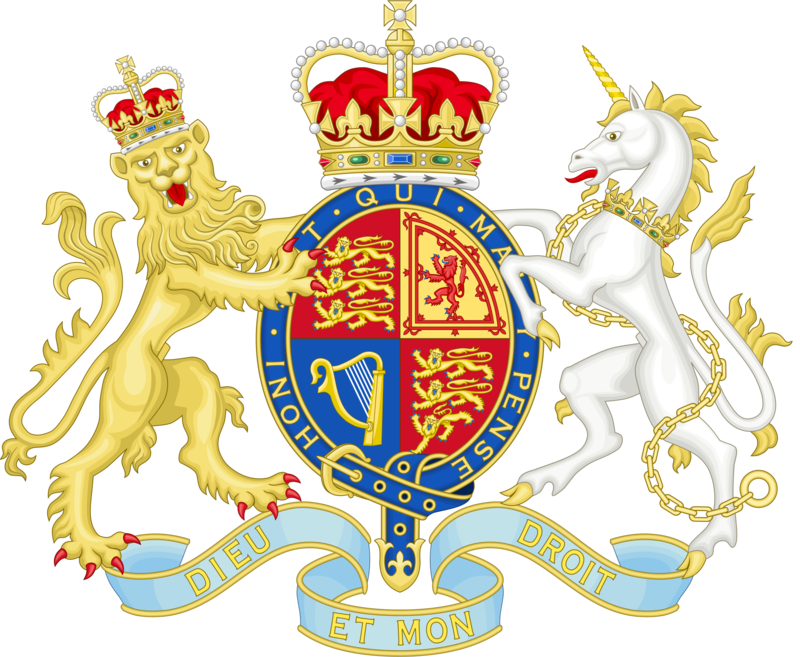 There are four CMOs in the United Kingdom who are appointed to advise their respective governments: Her Majesty's Government, the Northern Ireland Executive, the Scottish Government and the Welsh Government. Each CMO is assisted by one or more Deputy Chief Medical Officers. In England, the CMO is a member of the board of the National Health Service (NHS), a civil servant in the Department of Health, and head of the medical civil service. The Republic of Ireland has a similar officer. The Chief Medical Officer is a qualified medical doctor whose medical speciality traditionally was public health medicine, and whose work focused on the health of communities rather than health of individuals. More recently the appointees have been clinicians without training or experience in public health medicine. In the UK, the CMO is one of six chief professional officers who advise the government in their respective health and social care disciplines. The equivalent US term is Surgeon General. 2009 - Call to Make ME a Notifiable Illness? "helps people to live better for longer. We lead, shape and fund health and care in England, making sure people have the support, care and treatment they need, with the compassion, respect and dignity they deserve." From experience of dealing with all of the issues with ME - research, treatments, guidelines, education, perception etc - we would suggest that this is not a set of objectives which the DoH has exhibited toward people with ME - and by consequence, their families. Over the years the charity has had frequent communication with the DoH - some of them detailed here. The Medical Research Council is responsible for dispensing public funding - in the form of grants - to perform research - funded through the government's science and research budget. Invest in ME-Research has frequently contacted the MRC since it was formed as a charity - attempting to enter a dialogue which would change the way ME was researched and, therefore, treated. This not only consisted of letters to the CEO and other officials, but also by invitations to our conferences and research Colloquia, as well as initiating contacts to researchers outside the field of ME but who were working for the MRC and specialists in their own field and could bring knowledge and experience to bear on ME research. The charity has contacted the Prime Minister on a number of occasions. As can be expected these letters are rarely dealt with by the Prime Minister of their nearest advisors - but often ignored or passed on to the Department of Health. The National Institute for Health and Care Excellence (NICE) published their document for clinical guidelines released on 22nd August 2007). The document was proposed for use in the NHS in England and Wales regarding chronic fatigue syndrome / Myalgic Encephalomyelitis (CFS/ME). Although not an original stakeholder (IiME only became a charity in May 2006) we registered to become a stakeholder in these guidelines and supplied our response to the Draft Guidelines in 2006. Th charity has continued to create submissions to NICE and has attempted to engage with the NICE director to promote real change and progress in these matters. 2009 - NICE GUIDELINES - WHAT's NEXT? The USA National Institutes of Health (NIH) is part of the U.S. Department of Health and Human Services. The NIH is the largest biomedical research agency in the world. 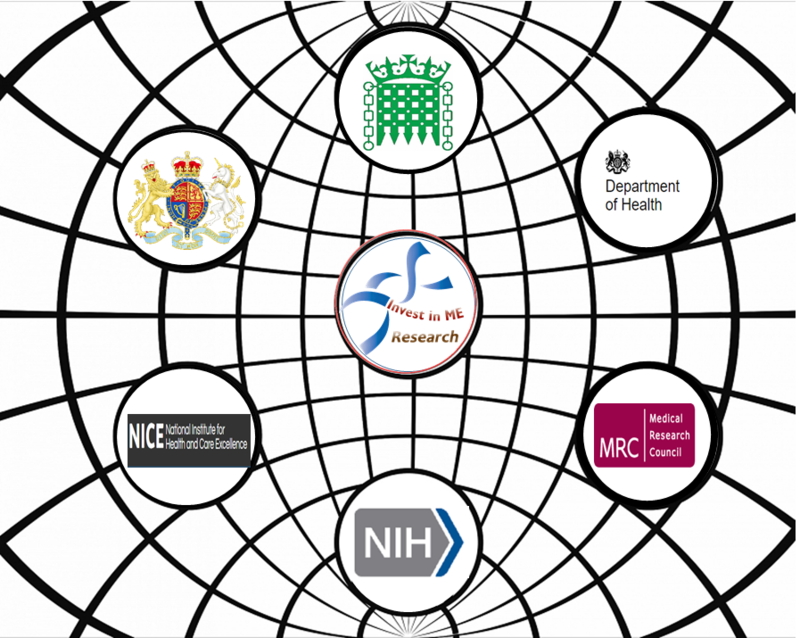 In 2015 the NIH published to reports on ME - the Pathway to prevention (P2P) report and the Institutes of Medicine (IOM) report. 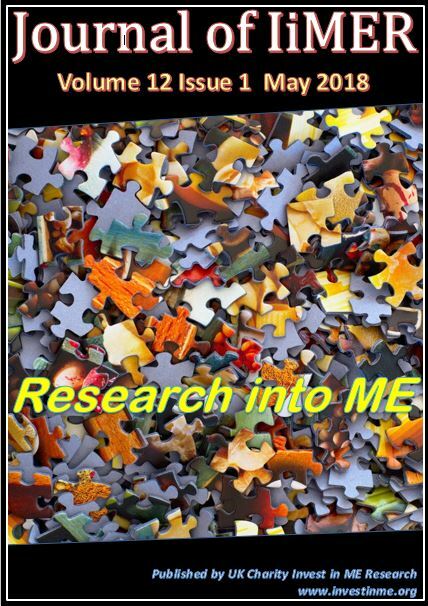 Invest in ME Research commented on those reports and made constructive suggestions to improve research into, and treatment and perception of ME. Subscribe to our free newsletter. Enter your details below. The pages on this web site are offered as a free access information provider. The views expressed on this web site by contributors and others do not necessarily represent those of Invest in ME Research. No medical recommendations are given or implied. Patients with any illness are recommended to consult their personal physician at all times. The views expressed at the Invest in ME Research International ME Conferences and at other Invest in ME Research conferences by the presenters and delegates to the conference and any information material distributed are their own personal opinions that are not necessarily shared or endorsed by the Trustees of Invest in ME Research. 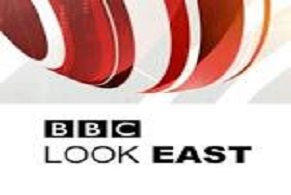 Invest in ME Research accept no responsibility for the views expressed or any subsequent action taken. The contents of any presentation should not be deemed to be an endorsement, recommendation or approval of such content by Invest in ME Research. The materials presented at the Invest in ME Research International ME Conferences do not constitute medical advice. No medical recommendations are given or implied by Invest in ME Research. Any person registering or attending the conference who may take any action or consider medical treatment or referrals should take detailed advice from their own medical practitioner. Invest in ME Research disclaims any implied guarantee about the accuracy, completeness, timeliness or relevance of any information contained at the conference. By registering for or attending the conference you agree that Invest in ME Research is not liable for any complications, injuries, loss or other medical problems arising from, or in connection with, the use of or reliance upon any information contained in the conference.